The cultural town of Ije-Ode is 110-kilometres north-east of Lagos, Nigeria’s economic hub, but the mission had been conceived in Abuja, the nation’s administrative capital. How sad, that today we speak about Prof Adebayo Adedeji in the past tense! After more than four decades of meritorious service to his country, the African continent and the world at large, in various eminent capacities, Chief Adedeji passed on last April 25th. The consolation is that at 87, he lived a fulfilled life and will be laid to rest on 7th July, having bequeathed an abiding legacy to generations of development thinkers in Africa and beyond. This writer was privileged to be part of a special delegation dispatched by the ECOWAS Commission on the Ijebu-Ode Mission, which was led by the then Commission Vice-President Dr Toga Gayewea McIntosh, and included Prof. Sam K.B. Asante, Ghana’s renowned political economist, both mentees of Prof Adedeji in the regional integration enterprise. Adedeji’s widely acknowledged role in the establishment of ECOWAS through the Treaty of Lagos of 28th May 1975, earned him the title of the “Father of ECOWAS.” Throughout his lifetime, he demonstrated an unalloyed commitment to Africa’s development, researched, spoke passionately, wrote ceaselessly about, and invested his intellect and material resources to this cause. The Ijebu-Ode mission was one of the few opportunities to sound him out on the ECOWAS vision. In one word, he insisted that cooperation and integration were the only options for Africa to overcome linguistic, political and economic barriers which the continent had inherited from its colonial history. 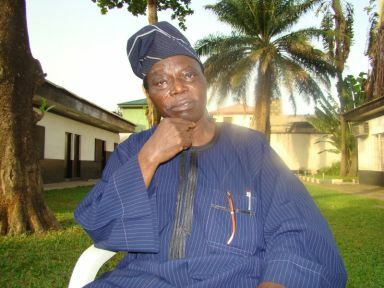 Adedeji recalled his “shuttle diplomacy” to various capitals in the sub-region in his days as Nigeria’s Federal Commissioner (Minister), and the critical roles played by his boss, Nigeria’s then Head of State Gen. Yakubu Gowon and his Togolese counterpart Gen. Gnassingbé Eyadéma in the formation of ECOWAS, which is 43 this year, and arguably, Africa’s foremost Regional Economic Community (REC). For Adedeji, charity began at home. As Federal Commissioner for Economic Development (1971-75) in Gowon’s administration, at age 40, the Herculean task of Nigeria’s economic reconstruction after the devastating civil war of (1967-70), fell on the man who became a full-fledged Professor at 36 having proven his academic prowess in Economics from the University of London and Public Administration from Harvard. Commissioner Adedeji also played a lead role in the establishment of Nigeria’s National Youth Service Corps (NYSC) Scheme, one of the most enduring initiatives for nation building that has impacted generations of young Nigerians. As the first Nigerian Professor of Public Administration in 1966 and Director of the Institute of Administration at the University of Ife (now Obafemi Awolowo University), Adedji taught and mentored early generations of Nigerian administrators. After the civil war, Nigeria needed to rebuild and also reach out to its neighbours and the wider world. When the idea of regional cooperation was mooted, Gen. Gowon gave him the “marching orders” to get other regional leaders on board. Seized by this task, Adedeji found a willing partner in Mr Edem Kodjo, his opposite number in Togo, under Gen. Gnassingbé Eyadéma’s administration. Kodjo, a former Secretary-General of the Organisation of African Unity from 1978 to 1983, and later Togo’s Prime Minister. Speaking on ECOWAS at 40, Gen. Gowon himself acknowledged that Adedeji dutifully carried out his “orders” of rallying regional leaders behind the integration agenda. Overcoming initial resistance from those who were otherwise pushing for Francophone African union, Adedeji’s negotiating skills were rewarded handsomely. He recalled that the Treaty of Lagos has remained one of the few legal unification instruments initiated by an unprecedented number of Heads of State at a sitting. Only a man, mentioned in a 2006 publication as one of the “World’s 50 influential thinkers on development” could pull off such a feat. But as fate would have it, Adedeji was soon to take his integration campaign to the United Nations Economic Commission for Africa (UNECA) in Addis Ababa, Ethiopia, where he served as Under Secretary-General and Executive Secretary for 16 years (1975-91), the longest tenure, so far. His dynamism under the UNECA platform resulted in the creation of two more Regional Economic Communities (RECs) – the Common Market for Eastern and Southern Africa (COMESA) and the Economic Community of Central African States (ECCAS) in 1981 and 1983, respectively. In a paper he presented at the 8th Inter-African Public Administration Seminar in Monrovia, Liberia as far back as November 1969, Adedeji had reasoned that: “We must pursue relentlessly the objective of establishing a new national and regional economic order in Africa based on an increasing measure of national and collective self-reliance.” This philosophy guided the formation of ECOWAS and the other RECs. Adedeji will also be remembered for his other unique initiatives such as the Lagos Plan of Action and the Final Act of Lagos, both in 1980. When the Structural Adjustment Programme (SAP) was foisted on developing and least developed nations by the World Bank and the IMF in the late 1980s, Adedeji and his fellow Pan-Africanist thinkers did not only raise the alarm but developed the African Alternative Framework to Structural Adjustment Programme (AAF-SAP, 1989). This was followed by the African Charter for Popular Participation (ACPP, 1990), as legendary blueprints for the continent’s home-grown development and governance paradigms. Some of his many publications include: Towards a dynamic African economy, 1989 – selected speeches and lectures (1975-1986); The African Social Situation: Crucial Factors of Development and Transformation, 1990; The Challenge of African Economic Recovery and Development, 1991; Africa within the World: Beyond Dispossession and Dependence, 1993; and Democracy, Growth and Development: Lessons of Experience, 1999. In recognition of his meritorious service at all levels, Adedeji was awarded national honours by seven African countries 1972-1985, crowned with a prestigious Commander of the Federal Republic (CFR) award by the Nigerian government in 2001. He is also a recipient of seven honorary doctorate degrees by African and non-African Universities. Upon retirement from active service, Adedeji set up the Africa Centre for Development and Strategic Studies (ACDESS) based in Ijebu-Ode and was its Chief Executive. Adedeji was not a man to shy away from public office at any level. But his attempt to secure the Nigerian presidency from 1991 through the ballot box after many of years of military interregnum was unsuccessful. This was not for want of trying. And that setback never deterred indefatigable Adedeji, who between 2005 and 2007, served as the lead panelist of South Africa’s African Peer Review Mechanism (APRM), a tool set up by the African Union as a barometer of democratic governance. “This is the only region in Africa where citizens can visit and stay in a country other than their own for at least 90 days without a visa,” he affirmed, in a reference to ECOWAS’ flagship Protocol on Free Movement of Persons, Rights to Residence and Establishment. The pace of progress in regional integration might be agonizingly slow, but there is some comfort that today, unlike in the conflict-scarred recent past when some ECOWAS member States had two governments – one in the bush and the other in the city – all the States are operating a democracy, no matter how imperfect. Even so, Adedeji had during the Ije-Ode encounter, made a passionate appeal on ECOWAS member States to work towards the harmonisation of policies, laws and regulations to consolidate regional integration, his life-long dream. Like the Cassandra in the Greek Mythology, Adedeji was an African Prophet that came ahead of his time. What a continent Africa would have become, if today’s African leaders were to grasp from their cosy Olympian height of Mount Kilimanjaro, the development vision Adedeji had nurtured and canvassed, literally sitting down? May God grant his soul peaceful rest and give expression to his immortalize vision!